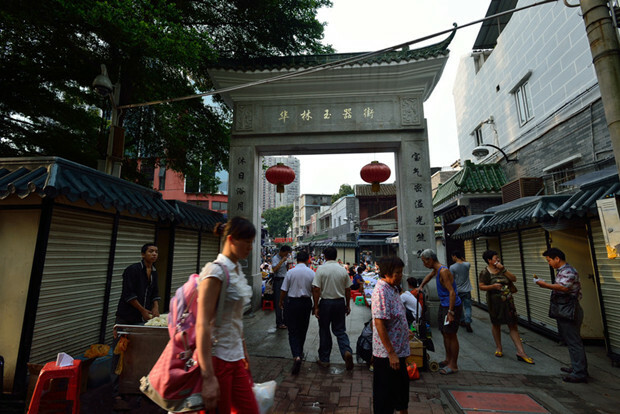 Introduction: Hualin Jadeware Street centers around Hualin Temple Qian Street, including Xilai Zheng Street, Hualin Xin Street, Maolin Zhi Street, Xinsheng Street and Changsheng Street. Along the 500-meter commercial street, you will find over one thousand shops selling dazzling jade articles. Over 80% of jade merchants in Guangzhou gathers here where more than 90% of the total trade volume of jade in Guangzhou takes place. The jade products here come from different provinces such as Guangdong, Yunnan and Henan provinces and even from Myanmar. Whether you are looking for jade pendants at a bargain price or expensive and exquisite jade rings, jade bracelets or jade ornaments, Hualin Jadeware Street has it all.